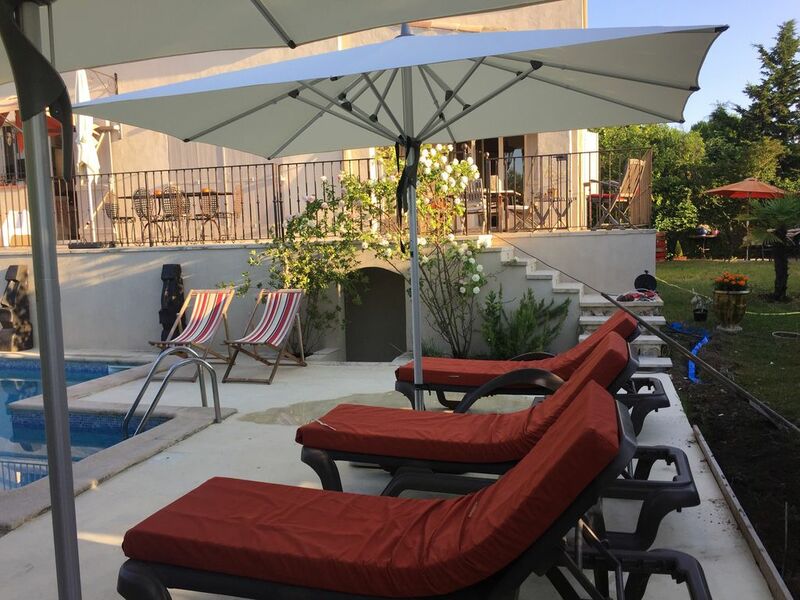 Very comfortable villa on 2 levels located in the town of Aix en Provence, north of the city, in a countryside environment, quiet 2 km from the city center. Residence reassured, on a ground of 1000 m2 rounded off and sported with privatory parking and automatic portal. Pool 10 x 5 m, dining area with BBC and plancha, sunbeds and deckchairs. View of Sainte Victoire and the mountain of the star. The house is perfectly equipped, with air conditioning in all rooms. Bright and bright it can accommodate 6 people. 3 bedrooms, including a master suite with bathroom + private toilet, a 2nd bathroom, a separate toilet, dining room-living room of 60m2 open on a fully equipped kitchen and overlooking 2 terraces, one covered. Stay of a week minimum. Deposit 2000 € to be paid on arrival and returned on departure if the house, its equipment and supplies are returned in the same condition as the arrival on the premises. Respect for the neighborhood is required. Great facilities, pool and outside space. The property was very clean and well maintained, even nicer than in the photos. Easy access to Aix (and parking), only a 2km drive. Aix is a great place to visit with its many shops, bars, resturants, museums and Cathedral. We had a very relaxing holiday and would definitely come back to this villa in the future. We booked this house with our son, wife and 2 young children. We spent a long time choosing it and definitely made the right choice. The house is stylish, beautifully furnished and very well equipped, and the garden is superb. The pool was stunning and bigger than the photo showed. Michelle was very helpful and good at communicating with us and it was all very stress free. The town is just about within walking distance if you are reasonably fit but there is also a bus stop a few minutes away. The view from the veranda over the hills in the distance is beautiful. Cézanne studio is a 10 minutes walk away. merci Graham pour ce commentaire. Je vous souhaite ainsi qu'à toute votre famille une très bonne année. C'est avec grand plaisir que nous vous accueillerons une autre fois. Beautiful property with garden and pool - comfortable and cozy retreat in Provence! This property provided a sanctuary for four women who really needed a vacation with beautiful views of the valley, a private garden, and a refreshing pools for the very warm summer days in July. Each of us had our own comfortable individually air conditioned bedroom, access to a well-equipped kitchen, a clean and cozy shared living space, and two outdoor balconies overlooking the pool with fig and apricot trees. Private parking was also provided.It is about a 1.5 miles outside of town with a bus stop right outside of the front gate. Michele and Bertram were excellent hosts greeting us warmly with breakfast ingredients for the next day. They even drove us to town late in the evening to ensure we found a restaurant despite our flights arriving quite late. You will enjoy each moment at this wonderful property. vacation. Would recommend highly and would have no hesitation in returning in the future. Une villa très fonctionnelle, très bien aménagée et avec goût. Idéalement située : proche du centre ville d'Aix et des commodités tout en jouissant de l'environnement campagne, donc au calme. A recommander aussi aux familles avec enfants en bas âge, la maison est disposée de façon à vite les repérer, cela fait partie de la tranquillité en vacances! Nous avons passé des merveilleuses vacances à Aix-en-provence. La maison était spacieuse et décorée avec beaucoup de goût. Nous avons bien profité de la belle piscine et du jardin, ainsi que des terrasses parfumées par les roses et chèvrefeuilles. Cette villa est idéalement située tout près du centre ville tout en demeurant dans la nature. Les propriétaires étaient charmants et nous ont bien conseillé pour les restaurants et activités du coin. Golf: Many golf courses nearby: Sainte Victoire, Set Club, Aix les Mille, La Salette in Marseille.